Seasons greetings, whisky enthusiasts and people who have stumbled across our blog by mistake while looking for something else entirely. We decided to squeeze in one more tasting before Christmas, partly because we’re not going to be in the same place at the same time for a few weeks, but mostly because we’d come into possession of some Fettercairns that promised very fine and seasonal things. 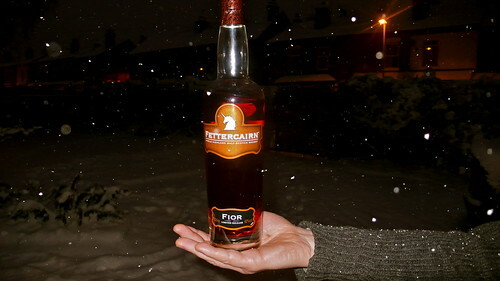 We started with the limited release Fettercairn Fior. Not much information on this – it was a bit of a mystery, and the box is filled with the kind of fanciful rhetoric you might expect from a bottle of whisky which takes as its emblem the unicorn – but it looks dark, rich and lovely. And indeed, it pours like a syrup. Off to a good start. We also had a range of other treats to sample from the Fettercairn range, and they varied in vintage from 24 years old, 30, to 40 years old. Normally the chance to try a 40 year-old whisky is a rare treat, but it was in such good company, its specialness diminished somewhat. Remember, while older usually means ‘more expensive’, it does not always mean ‘better’ when it comes to whisky. Finish: Very nice – crisp, but too short. If we were celebrating, and had a bit of spare cash (£140 give or take), the 24 year old would be a definite top choice. Most impressive and satisfying of the lot, by a good stretch. By contrast, the 40 retails for upwards of £700 a bottle which would place it squarely in the “collectors only” camp. But for the price of a standard single malt (around £35), the Fior is very highly recommended. Superb value, extremely good drinking and an exceptional Christmas dram. You should definitely treat yourself to a bottle. Have a great, safe and cheery Christmas!